Revolutionary Treatment Protocol for Total Head Pain Resolution! Each year consumers spend more than $4 billon dollars on over the counter headache medications to try to temporarily mask their headache pain. But anyone who suffers with chronic headaches & migraines knows the frustrations. The relief, if any is short term. The risk of dangerous side effects is high, and OTC pain medications do nothing to prevent the next big headache right around the corner. That's what makes the MiRx Protocol so exciting. It's a whole new approach with a goal of providing instant migraine relief, that is safe with long lasting results! For years scientists have known that migraine, headache and facial pain is controlled by a nerve cluster called the Sphenopalatine Ganglion (SPG) located in a difficult to reach area of the nasal cavity. The challenge has been, how to get medication or a topical anesthetic to the SPG to provide immediate headache relief without painful treatments or even invasive surgery. With the MiRx Protocol, the solution is as simple as a nasal spray. The procedure isn't painful and take seconds. It starts with an ingenious applicator and a simple nasal spray. Because the SPG is located deep in the nasal cavity, a normal nasal spray cannot reach the desired location. 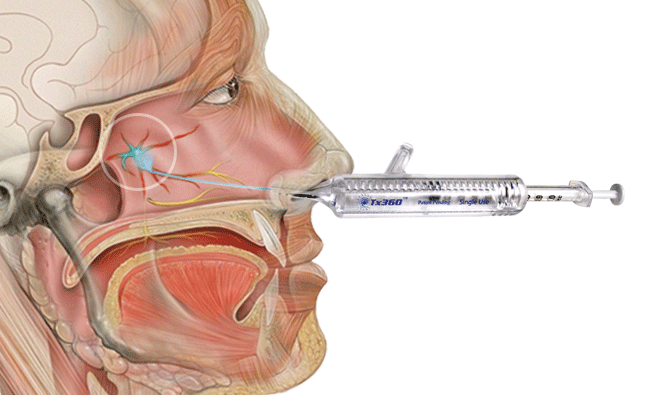 Unlike other nasal sprays, the revolutionary, Tx360™ nasal applicator has a soft flexible extension that allows the anesthetic agent to be sprayed directly on to the SPG. There are no needles. The result is instantat headache relief. The treatment takes less than a minute and most patients report a pain rating decrease from eight to two within seconds. With the MiRx Protocol, you can avoid the complications or potentially dangerous side effects associated with long-term use of prescription medications or OTC painkillers. The MiRx Protocol is even safe for use on pregnant patients. This is a total headache & migraine treatment plan. 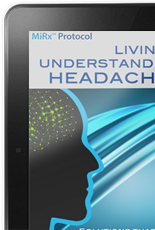 The MiRx Protocol has been clinically proven to provide long-term results with instant migraine & headache relief. (Read Clinical Studies) Some patients can experience lasting migraine relief after just one treatment, but those who have experienced chronic migraines or headaches for years may require the full treatment program for maximum benefit. 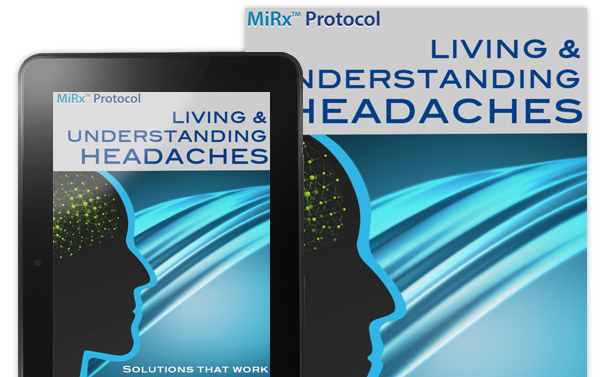 The MiRx Protocol is a treatment program designed to treat migraine, headache, facial pain, and head pain. The protocol is made up of two parts. The first stage of treatment stops the reaction of the nervous system and alleavates the headache pain. This is refered to as the medical component. The second stage of the MiRx Protocol treats and rehabilitates the underlying condition, which is the physical component. These two combined can effectively eliminate the conditions causing your headache or face pain. These two components work together to provide long-term migraine relief. The medical component of the MiRx Protocol uses clinical testing to make sure you qualify for the treatment. The data collected also helps identify obvious triggers of the headaches. Most patient’s qualify for the procedure and are treated during the first visit. 1. Is this Covered By Insurance? Most insurance plans and Medicare/Medicaid cover this procedure, since the procedure requires a medical doctor or registered nurse for treatment. 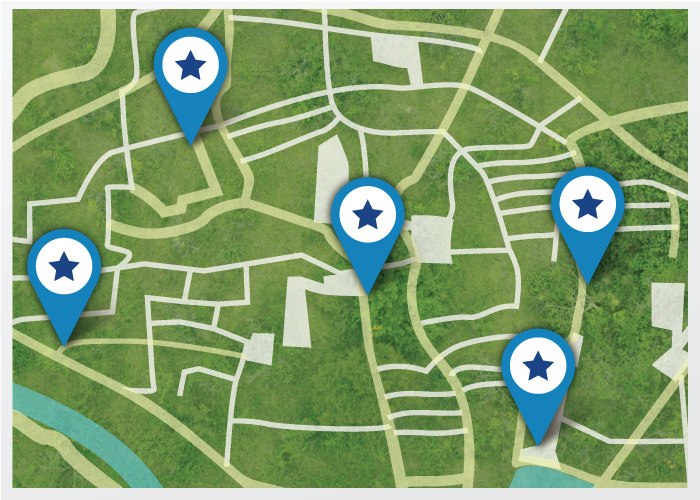 However, check with a MiRx provider near you to see if they accept your insurance. No, in fact many people they don’t notice any discomfort from the applicator or medication. Many of our MiRx providers do not require referrals, and offer a free consultation to see if you qualify for treatment. To be sure, we recommend contacting the MiRx provider near you. The procedure only takes about 30 seconds per nostril. Overall the average time in office is less than 10 minutes. 5. How soon will MiRx work? Headache pain relief is often times immediate, and typically after the second treatment the pain is not noticeable. In some cases headache pain is completely eliminated with one treatment. Since we are targeting the nerve cluster that communicates the pain sensation to the brain, relief can last for 24 – 48 hours with one treatment. The MiRx Protocol was clinically tested as a treatment plan to provide long-term relief. The duration of relief will continue to build until completely eliminated. 7. Does the spray burn the inside of the nose? No, the spray is a mild topical anesthetic and doesn’t contain any substance that will create a burning sensation. Be sure to notify your physician of any allergies or previous irritations. 8. Are there side effects? There are not any know side effect from the MiRx Protocol. In fact it is safe for use on pregnant women.